Bon-Ton, who owns Herberger's, will likely become the latest major retailer to cease operations. Update (4/17/2018 @ 10:29pm): Bon Ton, parent of Herberger’s and other chains, has officially announced the winning bid for its assets and confirmed liquidation. According to an official press release, the accepted bid was a joint venture from parties who will acquire the firm’s inventory and certain assets. A hearing to approve the offer and consequent “sale and wind-down” of Bon-Ton’s chain of 200+ stores, which includes Herberger’s, is scheduled for April 18th. The winning parties included existing debt holders who contributed about $100 million worth of outstanding debt owed toward their bid, according to CNBC. The company reported debt of more than $1 billion. The stores and eCommerce site will remain open and fully operational during the liquidation process, which some reports state will last 10-12 weeks. Details will be announced following the court approval. Of course, there’s still a chance for another retail operator to acquire part of the chain for continued operation, including one or more of its brands. However, there are no such reports of interested parties. The company, which hasn’t reported a profit since 2010, filed for Chapter 11 bankruptcy protection in February, shortly after missing a $14 million interest payment. It originally intended to turn around and continue operations, beginning with the closure of 47 stores. Unfortunately, these efforts proved unsuccessful and no qualified bid was received from a party interested in continuing the retailer. Herberger’s – the last surviving original anchor at Kirkwood Mall – will be the mall’s first significant tenant departure since CVS/pharmacy in 2010, and the last major anchor closure since Marshall Fields (formerly Dayton’s) in 2005. Herberger’s also has North Dakota stores in Minot, Dickinson, and Fargo. Bon-Ton has its roots back to 1854. Herberger’s was founded in 1927 in Osakis, Minnesota. Bon-Ton acquired Herberger’s in 2006. The company also operates stores under the banners of Bergner’s, Boston Store, Carson’s, Elder-Beerman, and Younkers. 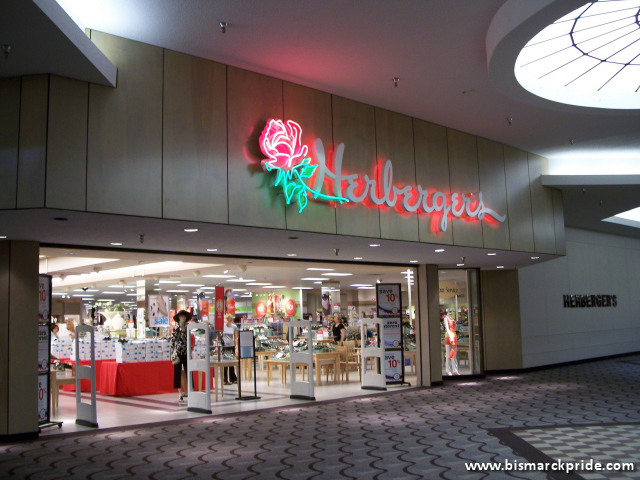 Herberger’s opened its Bismarck store on March 23, 1971. It was an original tenant at Kirkwood Mall and is the last surviving of the mall’s original anchors (Montgomery Ward and Woolworth’s being the others). It was the first Herberger’s to open inside of a mall, and the company’s largest at the time. A second store also existed at Gateway Mall (in the space now home to Harbor Freight Tools) from 1980-1994, upon acquiring the Moorhead-based Eckstein Department Store, who had replaced A.W. Lucas only the year prior. The Kirkwood store has been expanded several times. Its first significant expansion came during the mall’s Phase II expansion that concluded in 1979. Then located at the mall’s southern endpoint, the project necessitated Herberger’s vacating 23,000 square feet of its original space. In turn, the entire anchor space was renovated and extended, resulting in a 15,000-square-foot net gain. The store was remodeled again in 1985 and 1988 before adding another 30,000 square feet in 1993, in anticipation of closing its Gateway Mall store. Update (4/17/2018): The end for Herberger’s is now all-but certain after a bankruptcy court-supervised auction, which lasted late into Monday evening and will resume this morning, failed to secure a going-concern bidder interested in continuing the chain’s operation. According to multiple reports, including Reuters, the only qualified bids came from liquidators. Hope for long-term life was resurrected last week when Bon-Ton, parent of Herberger’s and other chains, announced that it had received a letter of intent from a group of investors that included mall owners to acquire the company with plans to continue its operation. Evidently, that group didn’t compete at the auction. This may have been, at least in part, due to a bankruptcy judge denying the group’s request to reimburse due diligence expenses. The judge also hinted that the groups bids were less secure. Any outcome is subject to bankruptcy court approval. One of America’s oldest retailers, Bon-Ton, who acquired the Herberger’s chain in 2006, is facing the possibility of liquidating and closing all of its stores. That is, unless it receives a favorable bid to keep its doors open. The company filed for Chapter 11 bankruptcy protection in February to restructure while it considered sustainability options. Around that time, it announced plans to shutter more than 40 of its stores. Since then, Bon-Ton has secured $725 million in bankruptcy financing to continue short-term operations and began soliciting bids for its assets and plans for an auction on April 16th. Certainly, a bankruptcy auction doesn’t necessarily spell doom. A belated bid saved Gordman’s from a similar fate just last year. One of those bids came from a group of creditors who is pressuring for the chain’s liquidation. In partnership with two liquidation firms, they intend to offer $740 million for its assets. In a last-ditch effort, an investment group consisting of two mall operators, DW Partners and Namdar Realty Group, has submitted a letter of intent to acquire the chain’s assets for at least $128 million in cash. If accepted, the group plans to continue operating the retailer. Despite this potentially promising news, the group’s proposal hit a setback after a judge denied a request to pay $500,000 to cover the group’s due diligence expenses. The judge further suggested that other bids were more secure. Either way, the retailer’s future will likely be decided soon.